So, I've purchased one of the STM32f407VET6 dev boards from a company called vcc-gnd with a goal to porting MicroPython to it. I have a pyboard 1.0 with a STM32f405, which is in the same family, so it shouldn't be too hard to port across. Does anyone else have one of these boards? Same provider also sells STM32F103C8T6 "Blue Pill" boards, which I am also interested in experimenting with. Why not just get another pyboard? Because they are like $60-80 AUD incl. shipping and this board is only $11 USD with free shipping! I'll run the risky code on the cheap board and if it breaks, no big deal. It's also a learning experience in the uncharted world of STM32. The board I purchased was from TaoBao, and thanks to a Chinese-English translation error, I had to pay $15 in shipping... twice! Once from the supplier to their Chinese warehouse and again over to Australia. I'll stick to AliExpress now. So far I have a butchered version of 1.8.6 running, based on OLIMEX_E407 and STM32F4DISC. Will keep you posted with my progress and make a PR once it's reasonably stable. Is VCC_GND_STM32F407VET6 a reasonable board name in /stmhal/boards/? Last edited by mcauser on Thu Jan 12, 2017 7:30 am, edited 1 time in total. Looks like a nice little board. It's cheaper than I can buy the raw processor. I've previously bought a few of the STMF103 boards to play with. They aren't big enough to run MicroPython on, but you can program them in C. If you're interested, I have a sample project here: https://github.com/dhylands/stm32-test that includes some files to build a simple LED blinker. I'd probably simplify the board name to just VCC_GND_F407 (but that's just my personal preference). Why not just get another pyboard? I'm more likely to send Damien, Paul and the team cold hard cash or bitcoins than to buy stickers from a 3rd party vendor. I am supporting the team, with contributions, promotion and community engagement. And later, I'll most likely back their next kickstarter. Open two terminals, one for st-util and the other to compile and upload. It should say "Listening at *:4242..."
LEDs will blink as the firmware is uploaded. Look for "Flash written and verified! jolly good!" Don't forget to eject the PYBFLASH USB device before unplugging. I was just playing around with this a bit, and it seems to be working pretty well. Most of which unbranded / clones / hard to find the manufacturer or documentation / inconsistently (re)sold from random shops. I was focusing on the vcc-gnd branded ones, as they have around 20 boards in their range, a reliable shop and a reasonable number of sales. Can't argue with $12 though! 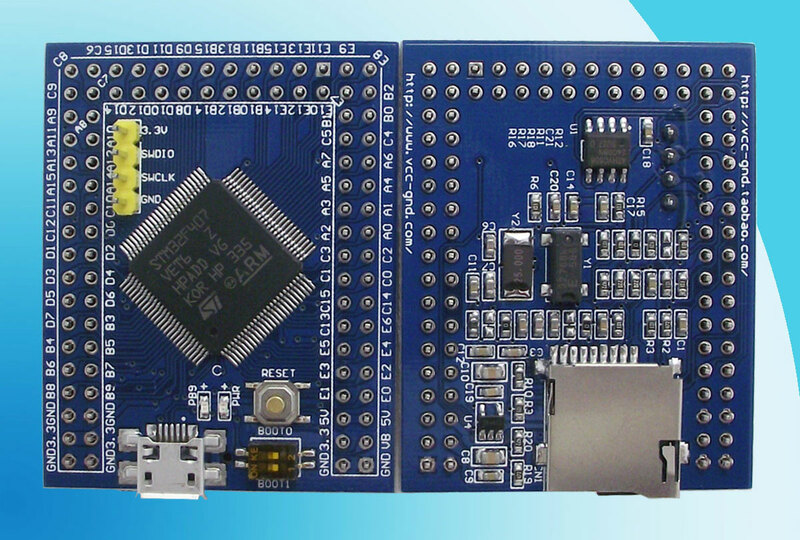 You can get STM32F103C8T6 boards for even cheaper, $1.70 USD. You're right @lmamakos. Thanks for that. I added that to my vcc-gnd-stm32f407 branch. Also tested UARTs 1-6 and I2C 1-3. All working. @loboris - I bought two of the black stm32f407s (with the coin cell in the corner). A VET6 and a ZET6. My next two board definitions.